Jalaloodin Mohammed Balkhi Rumi was born in 1207, in present-day Afghanistan. His family fled to what is now a major Turkish city. He studied languages, science, logic and Islamic philosophy. It was love and heartbreak that turned Rumi to poetry. And here we are centuries later, thanks to translator Nader Khalili, being wowed by his verses. Some of the poems, and almost a whole section, went over my head far as comprehension. I guess I'm not deep or spiritual enough. But I did understand the main message: people can find bliss and freedom through pure love. Across all religions, love is respected. Life is not to be wasted with sorrow or laziness. And this proves why Rumi remains a mystic poet capturing many religions. 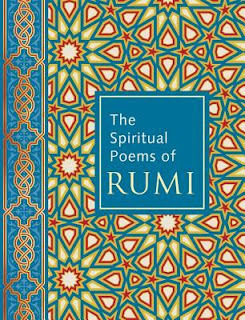 The Spiritual Poems of RUMI is a great introduction for readers new to Rumi while also giving fans a fresh collection to marvel over. One of the best features is the artwork and design on opposite pages of the poems. I must say it is a relaxing, enlightening read. Happy Pub Day! The Spiritual Poems of RUMI is now available.